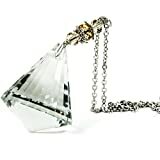 Crystal Bling Gem Cone Car Charm Hanger Ornament Sparkle Shine Facets with Chain. Customize your vehicle and show off your personality with this Unique Crystal Ornament. Oversized Gem is cut with prismatic facets to sparkle in the sunlight.